You have many alternatives for treating and controlling pain. The opioid epidemic continues to rise in America, and a 2017 report from the National Initiative for the Care of the Elderly suggests the crisis now affects more older adults. A main reason for the growing addiction to pain medicine is the ease with which it is often prescribed, according to Dr. Robert Jamison, a professor of anesthesia and psychiatry with Harvard-affiliated Brigham and Women's Hospital. "Primary care doctors often don't have much time to go over the various options available that may help relieve a person's specific pain, and it's easier and faster to write a prescription," he says. "Also, doctors don't always know enough about other therapies to feel confident enough to suggest them." Even if you are not dependent on opioids, long-term use may cause side effects like an upset stomach, nausea, constipation, and an increased risk of falls. Depending on your condition, the location of your pain, and its severity, there may be other pain management strategies available besides medication. If you find yourself automatically reaching for the pill bottle, speak with your doctor about whether any of these therapies might benefit you. Physical therapy can be an effective first step in addressing many common sources of pain, like those in the back, knee, and shoulder. In fact, a study published in the May 2018 Health Services Research found that people with low back pain who first consulted a physical therapist were less likely to receive an opioid prescription compared with those who went to a primary care doctor first. A therapist works with you to create individualized exercises, stretches, and body alignment positions that help relax tight muscles, decrease back and joint pain, and improve range of motion. Much research has supported using yoga to help with pain, especially back pain. A 2017 study from the National Institutes of Health found that people with low-back pain who took weekly yoga classes for 12 weeks experienced less pain and greater physical function compared with people who received educational information about how to deal with back pain. The yoga classes emphasized poses to help strengthen back and core muscles. Best of all, the yoga group was also more likely than the education-only group to stop taking pain relievers after a year. Pain is often made worse by your reactions to it, like stress and anxiety. "A therapy like cognitive behavioral therapy can help manage how you think and react to pain," says Dr. Jamison. "It doesn't directly heal the cause of your pain, but it may diminish the perception of its severity and perhaps prevent future episodes." With cognitive behavioral therapy, you learn how to respond to negative thinking in a positive way. The therapist helps to explore your negative thinking patterns, finding out what triggers these thoughts and how you react to them. Taking this information into account, the therapist helps develop strategies for you to use when pain brings on negative thoughts. Sources: Adapted from Journal of Pain Research, Nov. 1, 2017, pp. 2525–38; Vital Health Statistics, Feb. 2014, pp. 1–161. Some types of complementary therapies have been shown to help people with specific types of pain. Acupuncture. Acupuncture uses hair-thin needles that are inserted into the skin. These needles are thought to stimulate nerves in your body in a way that overrides your pain. Some studies have found the treatment helps relieve pain from a variety of conditions, such as low back and knee pain, migraine, and fibromyalgia, while other research has shown no benefit. For most people, it takes several treatments to feel results. Make sure to choose a licensed practitioner. Massage therapy. Massage therapy can help with muscular pain as well as pain made worse by stress and anxiety. For example, a 2015 study in Annals of Internal Medicine looked at how hourlong weekly massages could help people with chronic back pain. After 10 weeks, almost 40% reported that their pain was better or eliminated compared with just 4% of a control group who were treated with anti-inflammatory medication. Another study found that 20-minute massages given two and three days after cancer surgery reduced pain, tension, and anxiety levels. 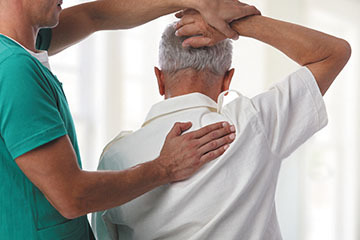 Some massage therapists focus their work on people recovering from injuries or surgeries or they may have training in dealing with particular conditions like back and neck pain. Botox injections. Botox is a neurotoxic protein that temporarily paralyzes muscles. While it is often used to smooth facial wrinkles, it's also used to temporarily treat muscle pain, like chronic neck pain and jaw pain. Transcutaneous electrical nerve stimulation (TENS). With TENS, a small battery-operated device applies a small electric current through conductive pads that are applied to the skin over the painful area. The current creates a tingling or pulsing sensation and works to disrupt pain signals from nerves. It is often used to treat persistent pain in the low back, neck, or shoulder. The science is mixed on its effectiveness — it may work for some people and not others — but it's relatively safe for most, although people with pacemakers should not use it. "Pain can interfere with all aspects of life," says Dr. Jamison. "It can make you less active, interfere with quality sleep, and increase the risk of social isolation and depression. So anything that can help relieve the pain and keep it under control should be considered, and fortunately there are many options available besides prescription medication." Can you put off that knee surgery?